Robert Huddleston, a combat pilot in World War II, appears regularly on the History News Network. Charles Michael Sweeny met Ernest Hemingway “in war-torn Turkey in the fall of 1922,” shortly before the Greco-Turkish war ended. Both were there as journalists to report on the conflict, Hemingway as a “yet-to-be” novelist employed by the Toronto Star. Sweeny, not truly a reporter, was reporting for the French government. But the two men did meet and established a friendship: “Sweeny was the war hero that Hemingway longed to be, while Hemingway was [to become] the acclaimed writer that Sweeny would have liked to be,“ claimed one who knew both. The friendship flourished until Hemingway’s death on July 2, 1961. Charles Sweeny, much older, served as an honorary pallbearer. So . 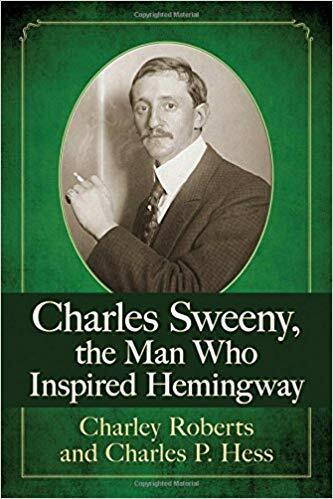 . . in those 39 years of friendship was “Charles Sweeny, the man who inspired Hemingway”? Perhaps. Both served in the Great War; Hemingway as a 19 year-old ambulance driver on the Italian front. And Sweeny as an officer in the French Foreign Legion, a rare role for a non-Frenchman, then as an officer in the American Expeditionary Forces (AEF) in 1917 when we entered the conflict. Both men were badly wounded – Hemingway in the leg, Sweeny, in the chest (he “took a bullet through the lung” requiring extensive surgery and weeks to recuperate). “After [World War II]” the authors note, “and continuing until Hemingway's death in 1961, Sweeny and Hemingway remained in contact through letters and visits.” Yes, Hemingway the novelist may have modeled certain fictional characters after known persons as do many novelists. But this hardly qualifies Sweeny, an impressive soldier of fortune, to inspire Hemingway, an iconic novelist and short story writer. Charles Michael Sweeny (a.k.a. Charles Sweeny, Jr.) was born in 1882 of well-off parents, their wealth coming from mining interests in the U.S. and elsewhere. Charles and his brother, Robert, decided their future; Charles to West Point, Robert to Yale and Harvard. Charles entered West Point in June of 1900 only to be ousted in 1901 for “excessive demerits.” The influence of his congressman got Sweeny re-admitted the next year..
“Sweeny completed the 1902-03 school year,” write the biographers, “but roughly halfway through the 1903-04 school year, he resigned.” Two reasons are offered: “academic failure” and/or “misbehaving.” Whatever, Charles Sweeny, Jr. was now free to embarked on his life as a soldier of fortune, that is "a person who works as a soldier for any country or group that will pay them; a mercenary." Heading south across the border, young Sweeny, an excellent model for the fictional James Bond though Bond served his government while Sweeny free-lanced, had no difficulty in finding a conflict where he could practice his chosen profession. He survived – barely – in revolutions in Mexico, Venezuela, and Nicaragua. He enlisted in the French Foreign Legion in 1914 at the start of the Great War, became an officer and "the first American to earn France's highest medal for valor." Unlike many, including the American president, who saw the Great War as "a war to end all wars," it appeared to have only fueled Sweeny's passion for conflict. He became a Polish brigadier general in their 1919-1920 conflict with the Soviet Union. This was followed by his involvement in the Greco-Turkish war – where he met Hemingway – and where he later became a military advisor to Ataturk, president of Turkey. Sweeny was commissioned a Colonel in the U.S Army Air Forces in World War II and an honorary Group Commander in the Royal Air Force (RAF). (He favored the RAF uniform.) and organized the recruiting of volunteer fighter pilots for Britain. France, and Finland (at war with the Soviet Union.) He was credited with having led the effort to create within Britain's Royal Air Force (RAF) three squadrons of American volunteers called the “American Eagles.” In fact, that role actually fell on Sweeny's nephew, also named Charles Sweeny. In his twilight years, Sweeny railed against President Roosevelt and several of our World War II military leaders. His attempt to write a book as to how WW II should have been fought and future wars could be avoided failed, though he did produce a pamphlet echoing his views. The book has a number of avoidable factual errors. Charles Sweeny, Jr. was given credit as having founded the Royal Air Force Eagle Squadrons – American pilots – who had volunteered. However, Charles's nephew Robert, "a decorated combat pilot in the RAF during the war" had a brother also name Charles Sweeny who was “the founder of the Eagle Squadron. Charles Sweeny, the uncle, however, did much of the recruiting of pilots and was made the honorary commander of the Eagles.” Also, the Eagle Squadrons did not fight in the Battle of Britain but entered the conflict later. A reported nine Americans did serve in the Battle of Britain (July through October 1940) and those that survived subsequently fought with the Eagles. Two books listed in the extensive bibliography deal with the RAF Eagle Squadrons: Eagles of the RAF by Philip D. Caine (1991) and The Eagles Roar by Byron Kennerly (1941), a memoir of his service with an Eagle Squadron. The authors described aerial combat featured in the Kennerly memoir. Colonel Caine, however, exposed Kennerly's book as a fabrication. He flew no combat with the Eagles and was literally run out of Britain for uncivilized behavior. In spite of this, the book was a success and formed the basis for the International Squadron, a motion picture featuring Ronald Reagan. As a capstone to the story, Kennerly was arrested for attempting to rob a bank! The Sweenys, all four: Charles, Jr., his brother Robert and Robert's two sons, Charles and Robert, Jr., deserve an honest motion picture with much derring-do from the RAF Eagles of World War II fame orchestrated by this amazing family.